Hey Everyone! SVGCuts.com turned one today! 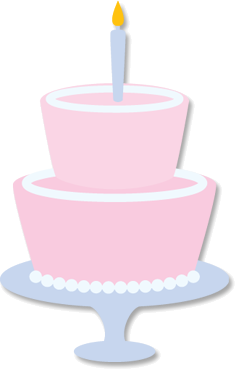 What better way to celebrate than with a free birthday cake SVG file! This element is perfect for ANY birthday related paper project! Happy Birthday to us and thanks to you for being a part of the SVGCuts family! This is a one of a kind element that is exclusive to our blog! 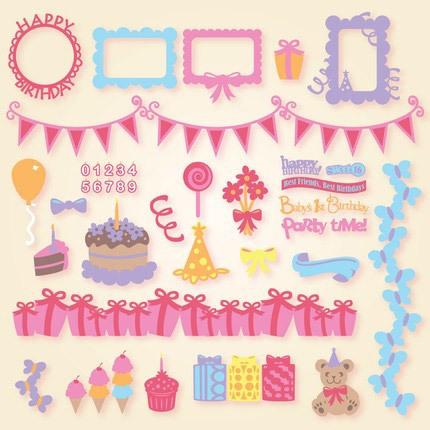 For more birthday related elements, check out the Birthday section of our store! If you need help learning how to cut a multi-layered design element, check out our video tutorial by clicking here and you'll be a pro in no time at all! This free SVG file has 4 layers! If you need help learning how to cut a multi-layered design element, check out our video tutorial by clicking here and you'll be a pro in no time at all! CONGRATULATIONS!!!! I can’t believe we’ve been together a year! Mary, your designs keep getting better and better, and Leo, you are a terrific webmaster. Here’s to many more years! Cute cake! Happy Birthday SVG Cuts. Love all your designs. Thanks for the freebie! This will be great for a Birthday Card. Can’t wait to try it out. What a fun birthday cake! Thanks! Happy Birthday to you!!!! Leo and Mary you should be proud of yourselves! Thanks for the cool file too! Congratulations on your first year and what a year it has been! Cake just in time as I was looking for a design to make a card for a friends 40th! Wow! Has it been a year already. Well,time sure fly’s by when your having fun with the cricut. Happy Birthday, Mary and Leo! Thank you for sharing all your wonderful files. HAPPY BIRTHDAY TO YOU!! Thanks for the cake! Yummy!! Happy Birthday to SVG!!! Thanks for all the wonderful freebies and a great year! Wow! Just one year? What an impressive number of files I have from you folks in that time. Happy anniversary to your site! Beautiful cake, can be used multiple times. thanks so much. This is new (Dec31) and so much fun!! Such a cute cake – I can see lots of uses for this. Happy Birthday to SVG and thank you so much for such a great site. how cute is this birthday cake! thanks so much for all you give us. wishing you many more birthdays! What a great cake. I love it. And, we get such a cute stand too. How awesome is that. Yup, lots of birthdays coming uo. It’s a whole new year. You are always on the mark Mary. Happy Birthday! and Here’s to Next Year…may it be happy and prosperous! Thanks for cake, I’ll be using it on my niece’s upcoming b-day card. Happy Birthday! Thanks for the cake!